Home / Baby Massage / Baby Massage Benefits: Reduce Stress & Sleep Soundly! Relaxing music, a soft blanket, sweet-smelling oils, a gentle hand – who doesn’t love a massage? So why wouldn’t your baby?! Infant massage is a wonderful way to connect and engage with your little one, and it offers a myriad of benefits. Even better, it is actually quite simple to learn and do. So before you book an appointment with your local spa, read on about why and how to massage a newborn baby! With everything a busy mom has to do, why should massage be on the list? Touch is actually an extremely important sense for a newborn, especially as it is one of their firsts as the other senses are developing. From the time a baby comes out of the womb, that skin-on-skin bonding with parents is critical and plays a huge part in establishing a sense of safety and security in your child. Touch is an infant’s first language and allows you to communicate and interact with your child. Baby massage is also very relaxing and can help with many common newborn issues – it soothes stomach issues and aids in digestion; it calms a fussy baby and can result in better sleep; it enhances a baby’s motor control and muscle movement, and it makes you a more confidant mom, skilled in handling your precious little one. All these lead to a healthier, happier baby which means a healthier, happier mom! By now, you are probably on board with why infant massage is beneficial. Now let’s discuss how to massage a baby. Like most things, there is more than just one way, but below are some common techniques. Set the scene: As mentioned, baby massage is quite simple – no fancy gadgets or equipment needed. You want a soft blanket that you can lay in front of you with your baby stripped down to just her diaper — after all, you want to maximize that touch language. Position your baby on her back, facing you. Mood: This isn’t about the ambience or music selection as much as it is about your baby. Infant massage is most effective when your child is in an alert state – not just after eating or when she’s tired. Like playtime, you want to approach infant massage when Baby is in the mood. Take it step by step: You want to move gently and methodically through each body area. When enough is enough, your baby will let you know. And don’t worry if she resists a particular area – just move on and gauge her mood as you go. So here we go! Check out our blog “Which Massage Oils are Good for Babies?” to help you choose safe and beneficial massage oils. Tummy – Typically, it’s good to start at the stomach; you can move your hands gently back and forth like a paddle wheel over the expanse of her tummy. Parents.com recommends starting at the rib cage and stroking downward with one hand after another, then moving to a circular motion at the belly. Remember your touch is soft and gentle, yet don’t be afraid. From there, you move your baby’s knees and feet in towards her stomach, gently rotating hips side to side. This can help relieve gas so be prepared if you’re on the receiving end! Legs – As you reach the extremities, you want to gently “milk” your baby’s leg with one hand on the ankle and the other one moving downward. Some parents use a soft, wringing motion to go up and down an infant’s legs. Feet can be a favorite massage point for babies (and a sensitive one as well), so check your child’s reaction to ensure she enjoys it. From there, gently squeeze and pull each little toe, and stroke the bottoms and tops of her feet. You can flex the feet back and forth at the ankles, as long as your baby agrees. Upper body – To massage the upper body, turn your baby on her tummy. Use two hands on her back, going in opposite directions up and down from diaper to base of the neck. For this area, some parents might prefer to pick up and hold their baby, using one hand on the back. Just ensure that you have a good hold on your child, and it’s probably easiest to do this in a sitting position. On the shoulders, use small circular motions and then move down to the arms. Similar to legs, move up and down as if gently wringing a towel or in a milking movement. 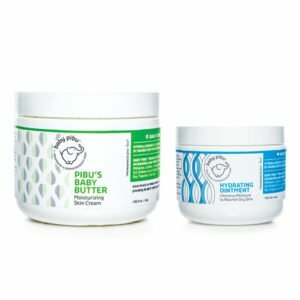 Massage baby after bath time and hydrate baby’s skin with Baby Pibu’s Baby Butter and Hydrating Ointment. Hands & wrist – You can move your fingers in small circles over the wrist area and then gently pull each finger after you do small strokes down from wrist to the fingers. Push back each hand, in a flexed motion and then bend it forward again. Head & face – Starting with her precious head, massage her scalp as if you were shampooing her hair. Run your thumbs over her eyebrows and extend them, and then oh-so-gently, trace your fingers over her shut eyelids. You can use other motions such as your fingertips in a circular movement on her jaw, or your finger tracing the bridge of her nose. You can cradle her head as you massage or gently trace from her cheeks to her chin. One note as you massage this area: you want to avoid Baby’s “soft spot” or fontanel. Baby massage should involve gentle yet firm movements so that it is soft yet intentional, not ticklish. Take your cues from your baby and know when she is done or just not in the mood. Much like a masseuse that you would visit, there is no one single way to massage your child, and while these are great suggestions to get you started, your pediatrician, parenting books or online tutorials can show you more. Most of all, don’t do it because you have to – do it because you want to, because it’s a bonding time for you and your baby, and because she loves it. Happy massaging and happy parenting!